Equipped with the latest AMD G-series APU dual core T56N 1.65GHz and AMD FCH A50M chipset, the NANO100 is ideal for graphics-intensive applications such as high-end medical imaging, digital signage, kiosks/POI, thin clients, and gaming machines. 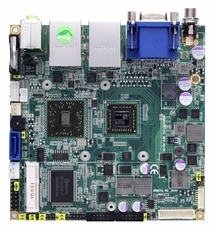 Measuring only 120 x 120 mm, it is 50% smaller than the Mini ITX form factor, which enables even smaller footprint system design and further reduces overall development cost. One SO-DIMM socket on the NANO100 supports up to 4GB of DDR3 1333 memory. 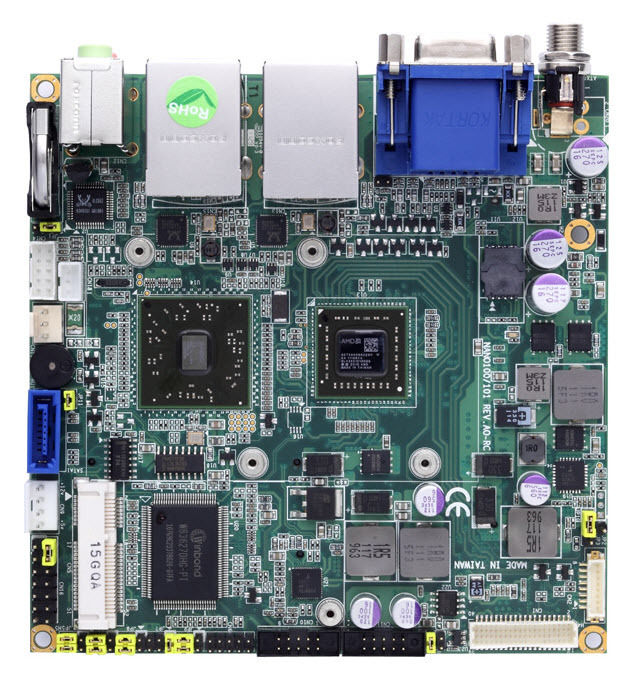 Integrated with Radeon HD 6320 graphics controller with DirectX 11 support, the NANO100 offers advanced 3D graphics and dual views via VGA and DisplayPort connection on the rear I/O, as well as onboard 18-bit/24-bit single/dual channel LVDS interface. The NANO100 also provides one PCI Express Mini card expansion for custom system configurations.